ADRIAN, a North African whose family had fled to Naples and later was Abbot of Nerida not far from Naples. St. Adrian was initially chosen to succeed St. Deusdedit (14th January) in the See of Canterbury, however he declined the honour stating he was not worthy and recommended St. Theodore of Tarsus (19th September) instead. St. Adrian accompanied St. Theodore to England where he became Abbot of SS. Peter and Paul, later called St. Augustine's in Canterbury. A renown scholar, St. Adrian soon made the school at Canterbury the centre of English learning. St. Adrian reposed in 710. BRITHWALD (BRIHTWALD), of Anglo-Saxon ancestry, the ninth Archbishop of Canterbury began as a monk and then became Abbot of Glastonbury. He resigned that dignity to devote his life to study and prayer at the small monastery of Reculver, near the Isle of Thanet in Kent. Upon the death of St. Theodore of Canterbury (19th September), 692, he was elevated to the Archbishopric of Canterbury; serving that See until his repose in 731. FOELLAN (FOILAN, FILLAN), (Eighth Century), after accompanying his mother, St. Kentigerna (7th January), and uncle, St. Comgan (13th October) from their native Ireland to Scotland, St. Foellan embraced the monastic life and laboured as a missionary until he was quite advanced in years. The place of his repose is called Strathfillan after him. MARCELLINUS of ANCONA, St. Gregory the Dialogist (3rd September) wrote of this nobleman of Ancona in the Marches, who was consecrated bishop of his native town circa 550 and reposed circa 566. It is said St. Marcellinus saved Ancona from a raging fire through his prayers. MARCIANA, during the Diocletianic Persecution (circa 303) St. Marciana, a young maiden in the Province of Mauritania (part of present-day Morocco) in North Africa was accused of vandalizing an idol of the goddess Diana. Having been beaten, tortured, and abused by gladiators, St. Marciana was thrown to wild beasts and finally gored to death by a bull in the Amphitheatre. 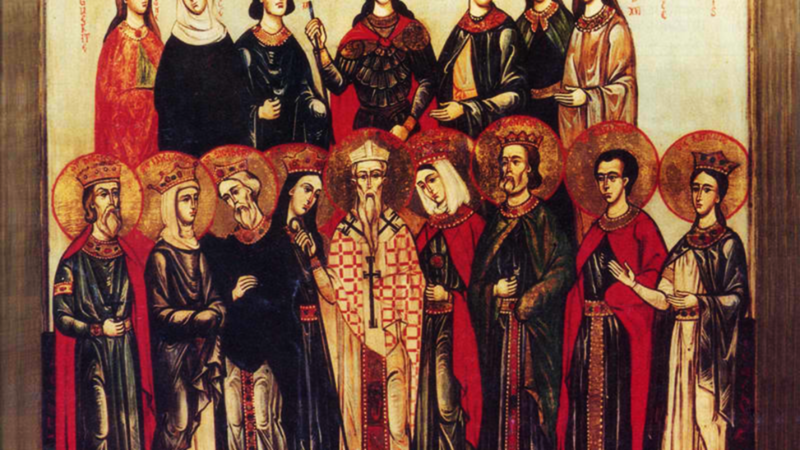 MARTYRS of NORTH AFRICA, a group of martyrs (circa 250) in North Africa said to number twenty-one, however, only the names of these fourteen have survived: Artaxes, Epictetus, Felicitas, Felix, Fortunatus, Jucundus, Pictus, Quietus, Quinctus, Rusticus, Secundus, Sillus, Vincent, and Vitalis. MAURONTUS (MAURONTIUS, MAURUNTIUS), founding-Abbot of the Abbey of Saint-Florentle-Vieil in Anjou. St. Maurontus reposed circa 700. PASCHASIA, a virgin-martyr who, according to St. Gregory of Tours (17th November), had been venerated for several hundred years in Dijon. St. Paschasia is believed to have reposed circa 178. WANINGUS (VANENG), a Frankish noble and courtier of King Clotaire III of Neustria, St. Waningus abandoned the world, received monastic tonsure, and later co-founded, with St. Wandrille (22nd July), the Abbey of St. Peter (later the Abbey of St. Wandrille) in Fontenelle, Normandy. St. Waningus soon went on to found the Abbey of the Trinité de Fécamp also in Normandy. He reposed circa 686.